It's Round Top time and the show official starts this coming Wednesday, September 29 and continues to October 2, you can try your luck on Sunday but most dealers are packing up and ready to get home. Unofficially you could have been shopping for the past week. Heading to Round Top and walking the pastures is my favorite thing to do. You never know what treasures you will find or silliness you'll come across. The Round Top Antique Fair has it all and more! Take a look at the photos I took in two days, and there is so much more (I'm going back). Mirrors, wine crates, and more, all beautiful and found in the Bar W field. The same booth in the Bar W field. Simple and perfect. Next to the Bar W field is Northgate (another pasture full of fun), these urns and balls were found there. Unique and fabulous. These stools are everywhere and in different heights. I love it, the industrial look and feel. I think you can mix it up with anything. Again they are abundant in the Bar W field. These buckets have been around for a while, they are perfect for legos, hot wheels, toys, toys and toys as well as other things and purposes. You can find them in the Bar W field under the red and white striped tent close to the road. They are about twenty dollars. These paint brushes are a great collection to start, they come in different sizes, colors, carvings and range from $15 to $30 and some a little more. The ones pictured can be found under the red and white tent in the Bar W field. Something more practical, a laundry basket. I bought two more of these (I had one) because they make pretty laundry baskets and since we have to do laundry why not look good doing it, They are $30 and found in the field at Northgate. 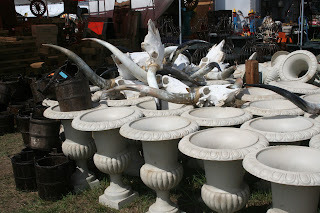 If you need a jar Round Top Antique Fair is the place for you. There is no lack of jars. Every shape, size and color. 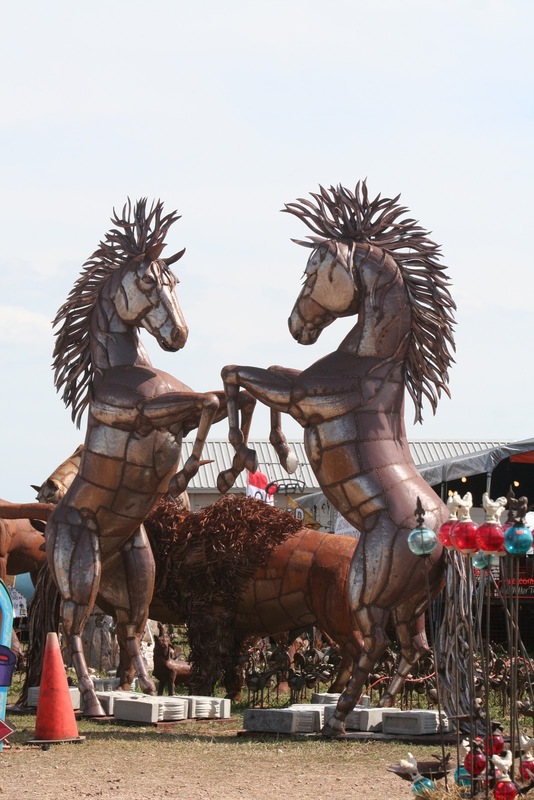 To give you an idea of how big these metal horses are, if you look behind them at the roof, they stand taller than the roof. If you need huge, giant horses here they are as well as a bull and several other animals. 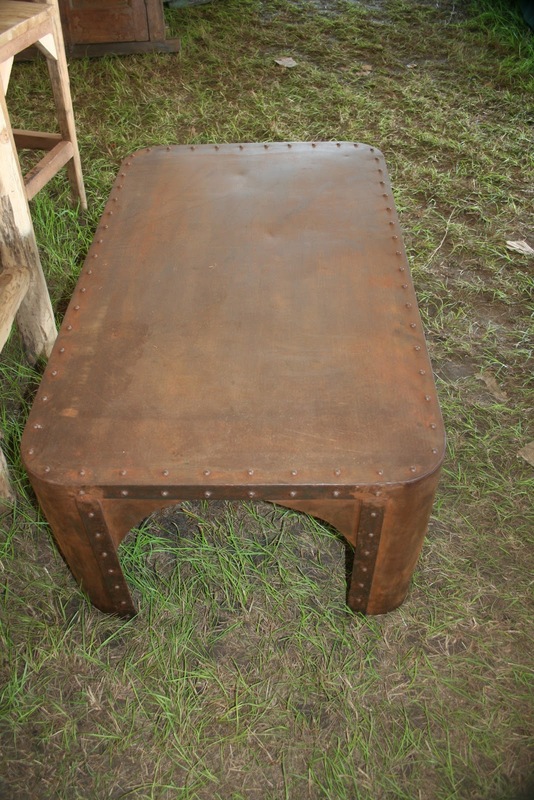 In the field I found this great industrial table, This would make a great table in a lot of rooms I've seen. Best part no fingerprints to constantly worry about, no nicks or scratches, I doubt you could do harm to this table. It is a WOW! I promise. Altars and crosses found at Hector the Collectors tent. Statues are not a problem to find if your on the look for one. This one was interesting, with lots of appeal. At this stop you can get urns and skulls. My furniture interest are definitely changing, I have been completely drawn to the industrial looking pieces. 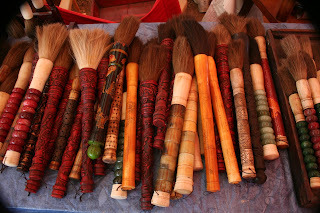 I would like to incorporate some into the mix of my home. This picture is of an incredible side table ($450) and big square coffee table. Both are my favorite tables found so far. I did buy this mail cart and this picture is taken in my home. It's rough and rustic and I liked it. At The Arbor tents you will find all things beautiful. This couch, the pillows, I want to sit and not get up. These are all planters/vases. LOVE IT! Again this picture is from The Arbors, the stools were sold in a set of four for $1,000, but they are adjustable. 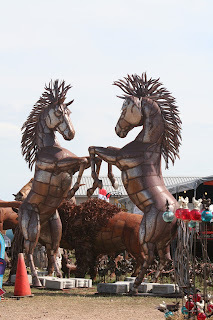 I would love to see these in my office/workroom. Another interesting table found at The Arbors. The top is covered in tin. 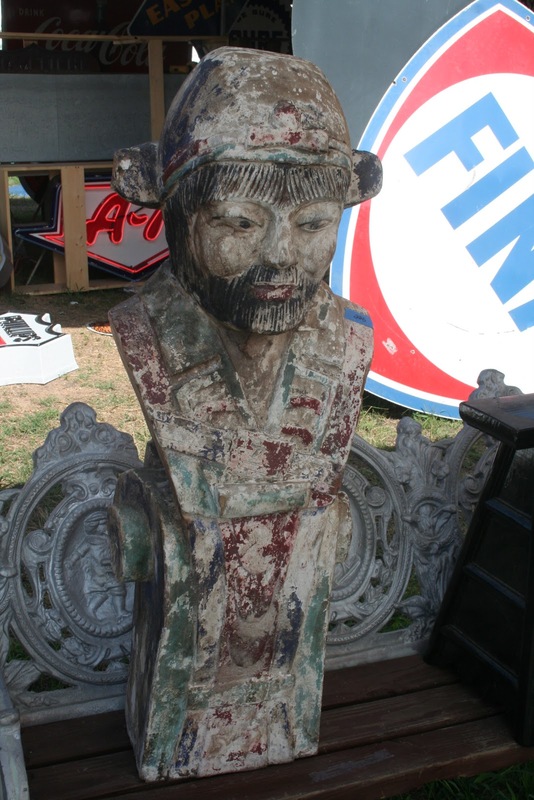 Junk Gypsy, everyone who attends Round Top Antique Fair regularly knows Junk Gypsy. This Thursday night they host the Prom and it's a big party with lots of tutu's present. 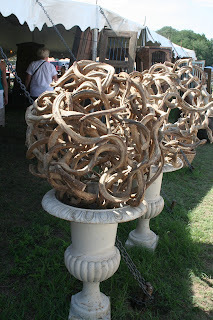 If you can't make it to Round Top google Junk Gypsy they have a fun website. 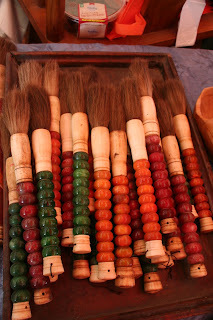 Just proof you can find anything during antique week. This is not my style, but I have to give credit to them it's original, creative and eye catching. If I was going to mention the picture above with the mannequins, then I couldn't leave this one out. This took someone some time! Another household item that is readily available: RUGS! I have an All-Star at home, so of course I had to take this picture. Mexican Art, pretty and if you look close the crosses are mixed with the Day of the Dead. I never let the week go by without stopping by to see the silver man. He has any silver pattern ever made and any piece your looking for. Right down to the Francis the 1st lemon fork I received as a gift. My new favorite accessory. 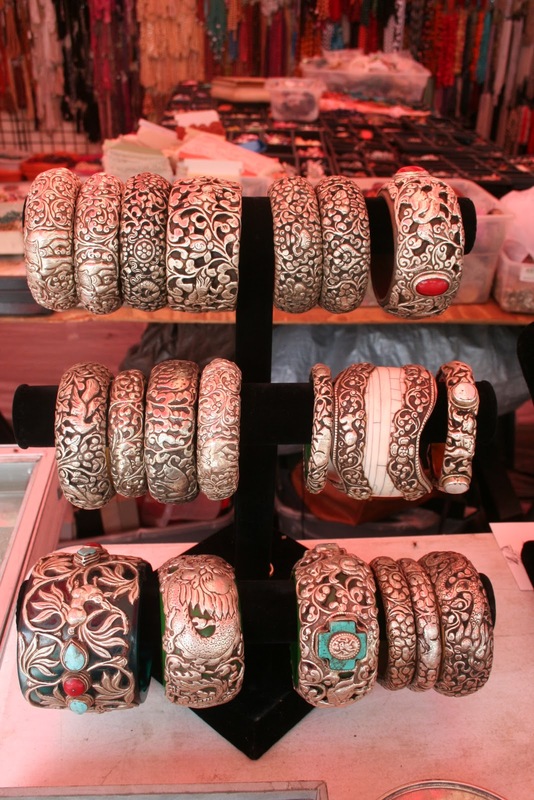 I've always loved bracelet and if I've said it once I've said it a hundred times, "If one bracelet is good, then ten is better." These are from Tibet and sterling silver, they start at $125 and go up to $600. They were (are) so so so beautiful. Count third from the top and you'll see I did break down and buy one, a small one. It's a start. I know, I know, I know could I possibly get one more bracelet on. The answer for today was NO. Grab your credit card and cash, and head to Round Top.